Most of us have seen the (out of place looking) CRUMBS Bake Shop sign up at the High Ridge Shopping Center. It's not yet open, but my fellow blogger Fairfield County Child is running a contest on her site to give away gift certificates to CRUMBS. Evidently this NYC-based shop, unbeknownst to me, sells kick heinie cupcakes. 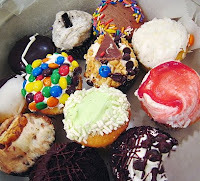 According to FCC, CRUMBS has a tradition of giving away 1,000 cupcakes on opening day, starting at 8am. I don't think I'd wait over 15 minutes for a free cupcake (unless other fun people are in line), but not much else goes on in this town, so I'm not counting myself out yet. An opening date has not been announced for CRUMBS, but they better not keep me waiting long, not after this build up. All the hooked-in Stamford women I know will not stop talking about it. The cupcakes cost $3.75, but I hear they are very big, so you can split one with a friend. I'm entering that giveaway right now, by the way. Update: Chris over at Lunch Break Chronicles says it might open Tues, Oct. 28. I am in for waiting in line with ya! Yum, cupcakes! I'm also up for waiting in line with ya. Given work's proximity to that plaza, I'm thinking my space in line could be pretty good! Thursday?!? Well shoot, that puts me out of the game!